Kirk House is nestled away in the quiet hamlet of Dull but don't let that fool you, this former church has immense charm and character. New to the market through CKD Galbraith, the property offers grandeur in a peaceful and secluded setting. The historical village of Dull, can trace its history to about 700 AD where it established itself as the intellectual centre of power and energy in Scotland. An abbey was built and this was established as the original seat of the Church of Scotland and provided the foundations for higher learning before moving to St. Andrews. The village is steeped in history with reminders of the smiths, masons and monks who settled here many centuries ago. Even Kirk House itself was previously owned by the Knights Templar and during the time of the monks, the confines of the sanctuary of the old monastery within Dull, marked by four stone crosses were a place of safety from capture and sanctuary from the law. One of these crosses still stands in the middle of the village. The property provides an impressive and airy space complete with stained glass windows, stone and timber flooring, a wonderful timber panelled ceiling and many other original features. Kirk House is accessed by a practical vestibule area with a cloakroom and boot room supplying additional storage space. 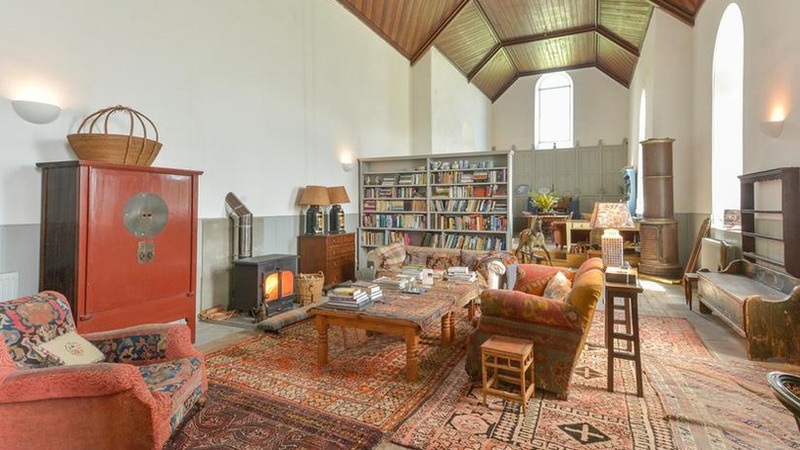 The principle accommodation within the former nave and chancel offers an exceptional living area and an extremely flexible space for entertaining. The kitchen and dining area is complimented by beautiful ornate panelling and the original organ has been retained and has become an integral part of the property. At one end of the property there is an area which has been set out as a study but could easily be incorporated into the main reception space or keep as a more private reading area. There are two further rooms on the ground floor, one is currently used as a bedroom with half-timber panelled walls whilst the other is a pretty bathroom with white fittings. Upstairs on the mezzanine first floor there is another bedroom with a wonderful outlook down onto and over the full space of the house. "Kirk House is a very rare conversion with so many original features retained and an impressive and very flexible design. The property would be ideal as a permanent home, holiday or retirement home as it benefits from ground floor accommodation or it would work just as well as an investment property. It's estimated that Kirk House could be let for between 800 and 900 per week as a short term holiday rental." "The popular town of Aberfeldy is only three and a half miles away and offers a selection of fantastic independent shops and cafes as well as a supermarket, bank, primary and secondary schooling. Towards the edge of the town you will find the Birks of Aberfeldy, a natural gorge with a wonderful footpath that is so beautiful it inspired Robert Burn's poem The Birks of Aberfeldie'. The bustling city of Perth is less than an hour's drive from Kirk House and offers a huge choice of restaurants, high street shops and all the amenities and entertainment you would expect from a large city." Kirk House is currently on the market for a guide price of 210,000. Get the full property details.